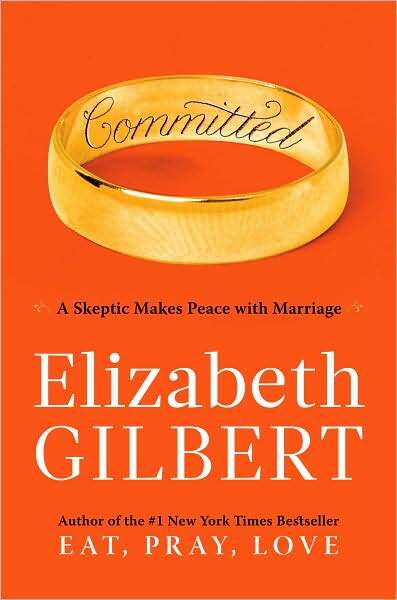 Last night, as I was staring at the wall for 8 hours, I finished Committed by Elizabeth Gilbert. This memoir/sequel to Eat Pray Love is a fantastic look at the history of marriage while telling the story of how she and Felipe - her lover from the end of her journey around the world - were sentenced to marry by the Department of Homeland Security. I don't know that I fell in love with this book as instantly as I did Eat Pray Love, probably because this book was grounded much more in academic research than that one. Parts of the book delved heavily into academic ruminations on the institution of marriage and its place in society. While these were appreciated and gave me a greater understanding of the ever-changing nature of this social pact, I think it might have taken something away from Gilbert's personal, funny, comfortable writing style that made the first novel so delightful. It's a hopeful story about finding that one person you can give yourself to completely, and how wonderful that feeling can be. 5 out of 5 pitchforks! I will think about getting this when I get out of this house =) it actually sounds like a really good book to me. thanks Fire Lyte!! !